Loyal followers of The Chronicles are well aware that, until very recently, I worked with All Hands Volunteers in the Philippines doing disaster recovery work. In Bohol, the work was doubly needed as that area had been devastated by an earthquake only a month before the recent Typhoon. The experience was hard work, but very rewarding. Each day, we were greeted enthusiastically by children running to the roadside to wave at our jeepney passing by, yelling “hello!” with bright smiles. The locals showed their appreciation with thank-you signs, and gifts of coconuts, bananas, and other snacks. And I discovered a new-found passion for the sledgehammer. However, I learned that I walked away (pun intended) with one more souvenir in addition to some unforgettable memories and many new friends. I contracted a case of what appears to be a staph infection on my left leg. 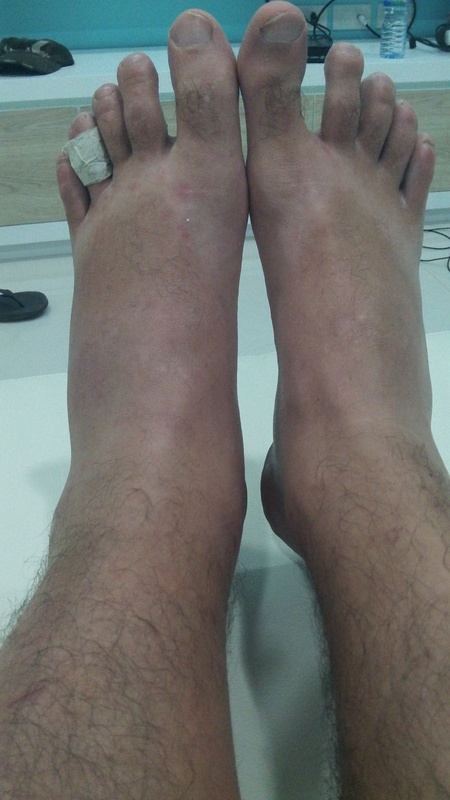 What started as a mere scratch I barely noticed while lifting some heavy object and brushing up against re-bar sticking out of the ground turned out to be a bit more troublesome, when, while on the way to Phuket from Bangkok, I finally noticed that my left foot had significant swelling. The next day, it was confirmed that I had a fever and an urgent need for antibiotics. Don’t mess around with possibly infected wounds, because the possible can turn into the actual in no time, without much in the way of notice. So, currently I am enjoying the holidays while chomping down on antibiotics and dressing my wounds. The fever has subsided, and I will in all likelihood live to see the new year. Of course, I am not mentioning this to dissuade any potential volunteers from getting their hands dirty. But if you do, be smart about and pay attention to what your body tells you. I have a tendency to downplay such things, and just ‘tough it out.’ This can work in some situations, but sometimes it is just not very smart. So much for today’s public service announcement. Hope everyone is enjoying the holidays! I think I have worked enough on my karma-balance to avoid any serious complications from this little issue. Besides, the healthcare in Thailand is good, and affordable..